It may be an old cliché, but you really do only have one chance to make a first impression. This is particularly true when it comes to showing off your accommodation online. With a staggering array of options to choose from, potential guests may spend mere seconds clicking through your pictures. How do you make sure you are presenting top quality hotel room photography to grab their attention and secure that all-important booking? We spoke to Kieran Nicholson from Kieran Paul Photography about how to capture that perfect photograph of a hotel room. First things first: Make sure your room is properly lit. Lighting is by far the most important part of photography. Use the light that is available to you in the room, whether that’s lamps, overhead lighting, natural light from the window, or even a cosy fireplace. The key is to look for soft light. Avoid harsh highlights or gloomy shadows. That way, your room will look warm and inviting. Early morning or late afternoon light is a safe bet for good lighting, so schedule your photography sessions wisely. It should go without saying that you should make sure that your accommodation is looking its best. However, keep in mind that the camera sees things the eye does not. Ensure that the room is spotless and tidy. You don’t want to spoil your perfectly lit pictures with a crumpled bedspread or wonky light shade! 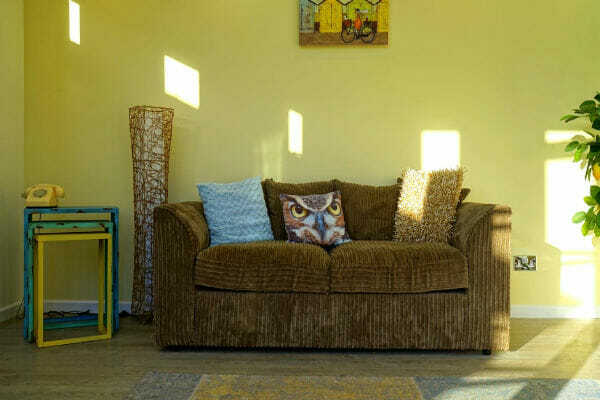 Place cushions and flowers as focal points in the photograph to give the picture a homely feel. But remember, when it comes to photographs, less is more. Don’t crowd the photo with bric-a-brac. Once your lighting is perfect, consider the angles of the room. Think about how to make it look as spacious as possible in your photograph. Go and squeeze yourself into the room’s corners to get the widest possible perspective of the room interior. 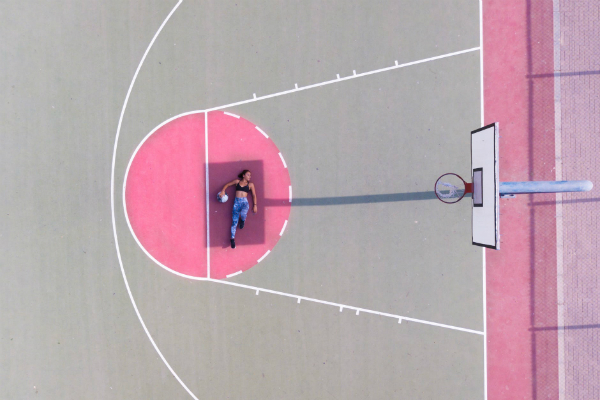 Experiment by taking photos at different heights and angles and see what looks best. For a full room shot, try to get as high as possible to make space look bigger. If you want more detailed pictures, then photograph at eye-level. Finally, if you have a feature that you’d like to show off, such as a large four-poster bed, take the picture from a lower angle to give your star attraction a dominant effect. Bathrooms are difficult to photograph. Glare from tiles and unwanted reflections of the photographer in the mirrors are hard to avoid, but nevertheless, you should put a little extra effort into taking this room’s picture. 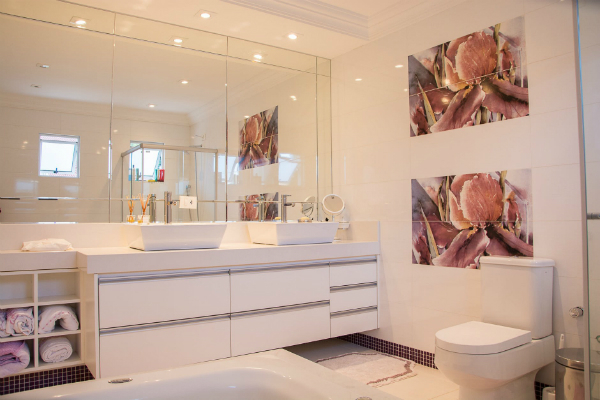 Your guests will be particularly interested in the bathroom’s cleanliness and features. The key is to experiment and follow the same principles as you would for a larger room. This way, you can make sure you get a shot to impress would-be customers. Play around with the lighting a bit. If you struggle, remember that it’s always better to overexpose your image rather than underexpose it. You don’t want a picture where your bathroom looks dark and dingy! Professional photographers recommend a full-framed DSLR camera, ideally with wide-angle lenses and picture storage in a RAW format. This setup gives you more control over the quality and editing of the image. But if all that sounds too complicated or expensive, then do not despair. You can get amazing pictures from most smartphones. Novice photographers can do just as well, if not better, with phones than with a pricey camera. Most smartphones also have photo filters, which can produce really nice effects and correct any lighting problems. It’s still important to frame pictures for greatest effect, so always think about angles when taking shots. There was a time when aerial photography was beyond the budget of most hospitality businesses. Bills ran into the thousands for a photographer in a helicopter. The introduction of drone technology has changed all of that. With aerial photographs now available for a fraction of their previous cost, you can now take your marketing to a new level with a drone. Aerial photography shows your hotel or guesthouse from a completely different perspective. It also allows potential guests to see your set and get a better idea of roads, parking and the stunning views they can expect during their stay. One note of caution though: If you do decide to opt for aerial photographs, hire someone who is licensed and approved to fly an Unmanned Aerial Surveillance Vehicle (UASV) to make sure they are competent to do the job correctly and safely. I myself am fully licensed and have worked with some fantastic properties. To see our technology in action, watch our latest video we shot at Allerton Castle. I can’t thank Kieran enough for taking the time out to share these fantastic tips. I have written a lot about how important quality photos are for hospitality websites and listing sites. Click here for more about listing sites and here for tips on improving your website.